Disclaimer: This review contains spoilers for previous books. Kings Rising was one of my most anticipated books for 2016 and it has lived up to its promise. The story picks up in the middle of a scene. At the end of the previous book, Prince’s Gambit, Damen had been left in charge of a Veretian fort. His true identity as the Akielon prince had been revealed thanks to the arrival of an Akielon army. Kings Rising opens with the Veretian response to this announcement. Needless to say, it’s a tense and action-packed beginning. Prince Laurent is absent for this response, being away with most of his forces as they attempt to capture another fort. He, too, gets an action-packed beginning–a little too much so, for me. 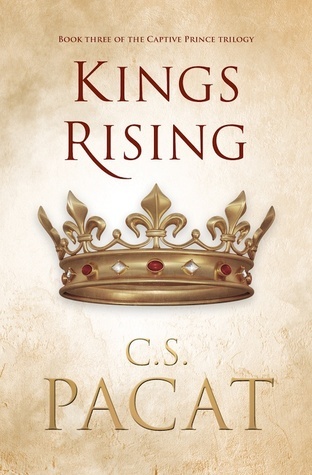 Being keen to find out how the story ended, I’d not taken the time to reread the previous books before starting on Kings Rising. It took a little time for me to orient myself and the beginning of Laurent’s story made this harder because it doesn’t follow straight on from his last appearance, as it does with Damen. Needless to say, the book doesn’t stand on its own and I’d recommend at least skimming through the last chapter of Prince’s Gambit before starting on Kings Rising if it has been a while between books. Although there’s a reasonably large cast, the focus is kept very tightly on Damen and Laurent. There might be kingdoms and countless lives at stake, but the core of the story is their relationship. With Damen’s identity now revealed, the pair must get to know each other for who they really are. The weight of the past is very present but at the same time they’re forced to start over. This gives the book a very satisfying emotional arc that almost broke my heart in places; it’s a book with all the feels. Not only must Damen and Laurent start over, but now that Damen is the rightful king of Akielos instead of a slave their customary ways of relating to each other become inappropriate. The gap between their public relationship and their private one makes for some fantastic tension. I especially enjoyed the way it proves quite a struggle for Damen; the occasions where he slips up make for some poignant moments. Throughout the story, the spectre of the Regent looms over them. This was so wonderfully handled. The Regent himself is only present for two scenes towards the end, and yet his presence infects the rest of the story. Most of the characters behave in ways that reveal his influence, making him a threat without even needing to be present. The ending has a wonderfully poetic symmetry… but I won’t spoil it for you. Overall, Kings Rising is a brilliant conclusion to theCaptive Prince trilogy and one I highly recommend.